Principal Davies didn’t realise that banning tackling games would mean that our need to tackle would build up and build up until it had to come out. It came out one recess on the EBO – the oval across the road from school. I tackled Jack, even though tackling was banned. I broke the rules and I think I broke Jack’s arm. Fadi is a big by with a big heart. Being a year older than everyone else, and with Samoan heritage and a love for rugby, Fadi feels like whenever he moves he breaks something. But staying still is too hard, and sometimes stuff just seems to happen. Fadi is a book about getting into trouble, fitting in and learning to like yourself. Gently humorous, the story is also realistic, exploring issues which might confront contemporary children. 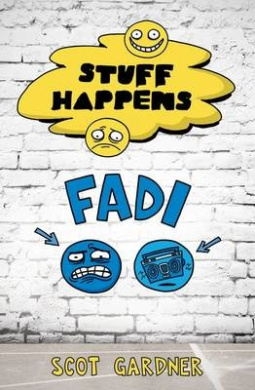 Aimed at chidlren in middle and upper primary, Fadi is part of the Stuff Happens series from Puffin Books and will engage both competent and reluctant readers. ‘Barba passes to Ennis, Ennis to Morris, Morris finds space out wide, he steps one, steps another, he’s in the open …’ CLICK. Mum turns off the TV. ‘Aye, why’d you do that? Mum! Bulldogs were about to score!’ I say springing off the couch. ‘We’re leaving, son,’ Mum says. ‘No way! Are you gammin’?’ Morris scoring for the Bulldogs is now a distant memory. Eleven-year-old Dylan is not happy about moving to Brisbane from his home in Mt Isa, but it’s happening anyway. In Mt Isa, he could keep the secret of what happens when he gets angry. But he settles quickly at his new school in Brisbane, despite a run-in with the local bully Jared. He makes friends with Justice Jones and begins to relax. Things are looking good when the whole class sets out on an excursion to watch the Brisbane Broncos rugby team train. Then Justice attracts the attention of Jared and his cronies and Dylan gets angry. When Dylan gets angry, he transforms into a powerful, fully-grown man, which terrifies him. But this time is different. This time, as he tries to hide, he discovers that the strength and power that scare him are exactly the skills that the Broncos are looking for. With the help (sometimes) of his friend, he is soon training with the NFL club. Deadly D and Justice Jones: Making the Team is co-written by a former rugby star and a teacher and is the first of a planned series. It introduces Dylan (Deadly D) an indigenous Australian and Justice, with Islander heritage. They are at the end of primary school, sports mad and on the brink of adolescence. It’s almost possible to smell the hormone surge as Dylan transforms to Deadly D. Prince and Hartley celebrate the powerful and positive role sport can have in the lives of young adolescents in this rugby-meets-magic tale. Readers will empathise with Dylan as he learns about this new body, and chuckle at the enthusiastic excesses of his mate Justice. Sports fans will revel in the inside look at life in a NFL rugby team. Chapters are short, include illustrations from Dave Hartley and chapter headings. ‘Deadly D and Justice Jones’ is ideal for upper-primary sports-mad, can’t-sit-still boys and older reluctant readers. We had just walked past the half-way line when we heard it. The heavy, thudding sound of a helicopter, coming in low over the hills. The sound very quickly got louder. Choppers aren’t known for their lightning speed, but this baby was certainly moving. It was flying without lights as well. By the time we picked out its shape silhouetted against the night sky above the floodlights, it was right on top of us. It swooped in and landed in a corner of the training field, forty metres away. As soon as it touched down, a side door opened. Six men hit the ground running. they were wearing balaclavas, and were dressed in black combat fatigues. All six of them were carrying black assault rifles. Without a word they fanned out and sprinted across the field towards us. Fletcher Smith is a 14 year-old boy, living in his father’s office at the Australian Institute of Sport. His parents are recuperating in a Swiss health farm after a car accident that Fletcher knows was no accident. He is sure the crash was masterminded by Samson Bolivar, high-flying sports-management specialist and (according to Fletcher) master criminal. In his parent’s absence, Fletcher is taking on some of his family’s sports crime investigations. It’s a great way to avoid going back to school. Blood Sports begins with Fletcher and his friend/minder, Frank Suleymanoglou, witnessing a high-tech kidnap of the newly appointed super coach for the Australian rugby team. Even though no one has employed them, Fletcher and ex-boxer Frank begin to investigate. There are many suspects, so they start with the closest – the recently sacked captain of the Australian rugby team. Blood Sports mixes criminal investigation on a grand scale with elite sport. Jonathan Harlen puts his tongue firmly in his cheek and takes the reader on a roller coaster voyage through the rarefied world that is elite sport. In the best tradition of private investigation, Fletcher and Frank experience high octane adventure and repeatedly escape the most un-escapable circumstances. Think teenage Bond with the same level of adrenalin and absurdity. There is techno-speak to spare, whether it’s on the specs of helicopters, the importation of banned weapons or the pathway to tennis stardom. Blood Sports is the second in Harlen’s Fletcher Smith Sports P.I. series. Recommended for upper-primary to lower-secondary readers. ‘When can I hold you then?’ he whispered. ‘I want to. I…’ He was going to say I love you – but what did that mean? Rugby is the only thing that matters to Xavier. He’s in year 12 and wants desperately to make the school’s first fifteen side, and play with his mates to win the premiership for the first time in twenty years. His world starts to change, though, when he meets Nuala Magee. He’s never met a girl anything like her. She dresses like a boy, acting out a role which incenses boys and amuses other girls. She’s hard to get to know, but Xavier is determined to do just that. Touch Me is a gripping read about rugby, first love and growing up. Xavier is a likeable main character, and the reader also sees important scenes from Nuala’s perspective, so that an understanding of both characters and the difficulties of their relationship is developed. A third important character is Xavier’s new friend, Alex, who is recovering from leukaemia and has had to face his mortality. First published in 2000 by UQP, it has been republished by UQP along with others of James Moloney’s works, a wonderful opportunity to discover or rediscover his works, for individual readers, collectors and for libraries. UQP, 200, 2007Fishpond. Buying through this link supports Aussiereviews.